For those who shoot with Nikon, you may have noticed that their current lineup of teleconverters only work with certain lenses. This is due to the fact that the front element of the TC protrudes beyond the lens mounting flange. 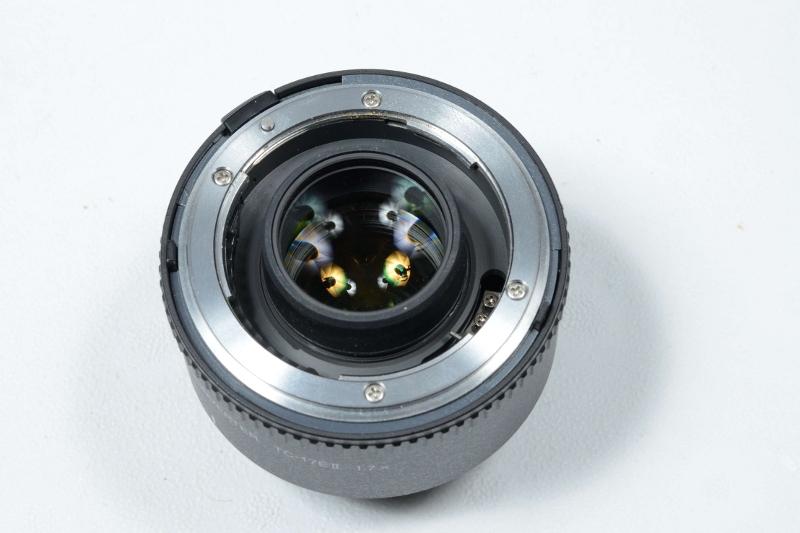 This can cause it to strike the rear element of many lenses. 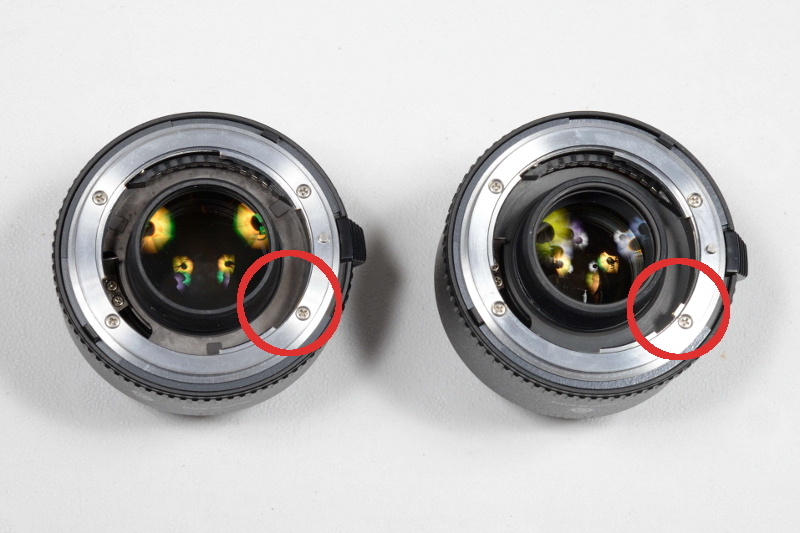 To prevent Nikon users to putting the TC on lenses not designed for use with them, Nikon added a small tab to the standard F-mount. This mates up with a matching notch in the lens. Without that notch in the lens, the TC cannot be mated to the lens. In this image, the TC on the left has been shaved, while the TC on the right is not. 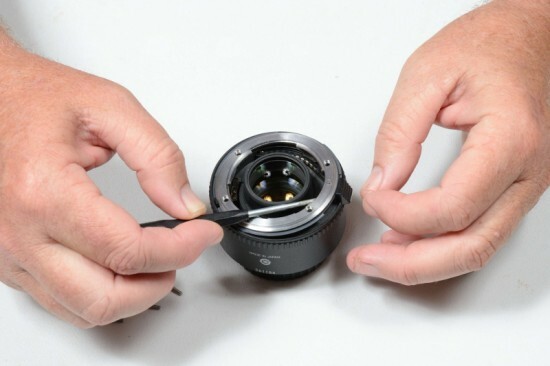 However, if one were to remove the tab on the TC, then this feature is defeated and allows the TC to be used on other lenses, both Nikkors and third-party lenses. Now keep in mind..... you are altering the TC without Nikon's blessing, so you are voiding any warranty you may have, in addition to making the TC where Nikon may not provide service for it even if you were to pay for it. Also, keep in mind that many lenses will still not be compatible with the TC after shaving due to obstructions in the rear of the lens, either the glass itself or other physical parts of the lens. So the standard "Proceed at Your Own Risk" warning is hereby inserted. Proceed at your own risk! After I heard about 'shaving' Nikkor TCs, I did the usual Google search and found a lot of references to it, but very little about how it's actually done. So I decided to rectify that situation here with a tutorial about the procedure. 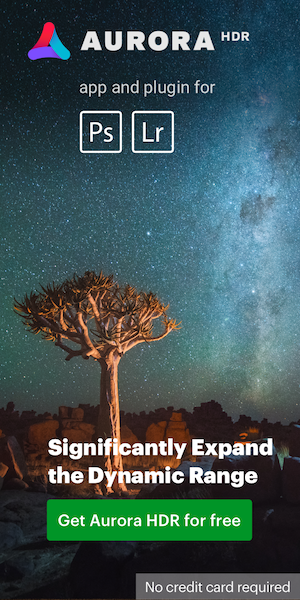 And it's astoundingly simple. It's basically grinding off the little tab. So to start with, let's assemble our surgical staff. We need the patient, in this case my (yes, still under warranty Nikkor 1.7 TC II). For operating tools, we only need two or three. First is a No. 00 Phillips screwdriver. 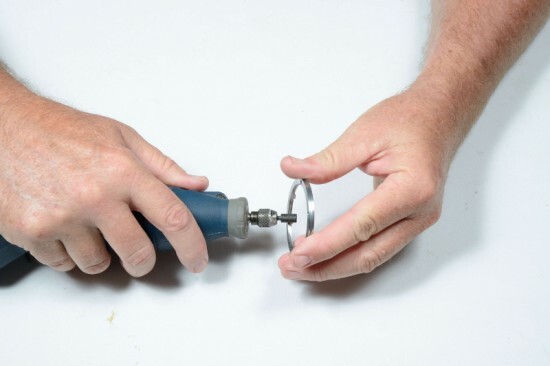 This is to remove the mounting flange ring from the TC. Wait...what? We're going to disassemble the TC? (I can hear No. 5 now..... "No disassemble!") Well, of course we are! You think we're going to do this while the ring is still attached to the TC, and risk ruining the glass? Fear not..... even the most inept in the mechanical abilities department can do this. Yes, it truly is that simple. The only other tool(s) we need is one to grind off the tab. 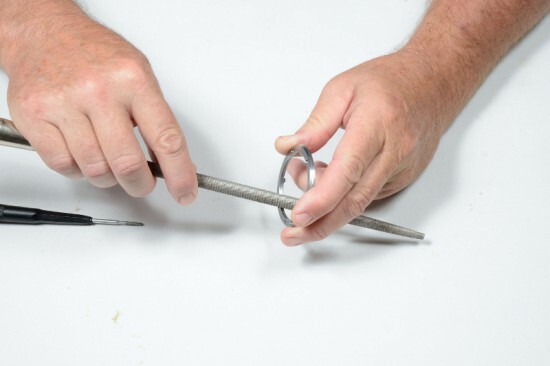 A simple round file will do, but it will take longer. 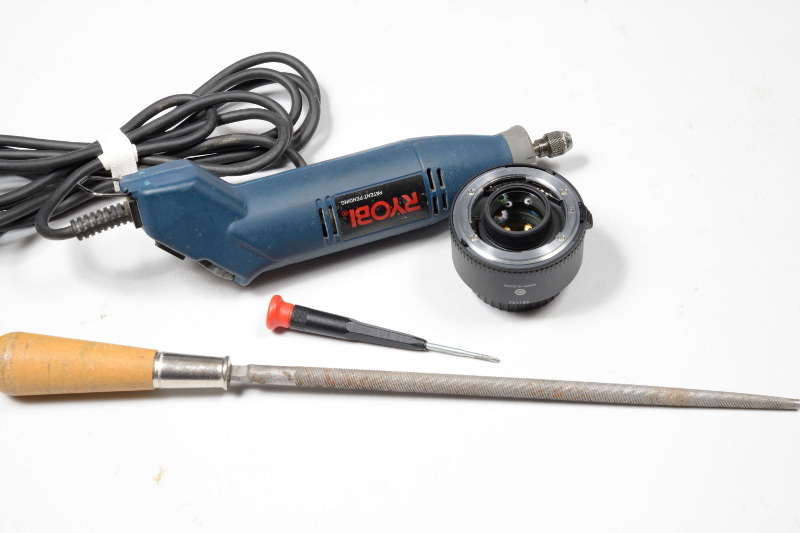 Or, you can use what most who perform this procedure with, and use a hobby drill (AKA "Dremel tool"). With our cast assembled, let's begin. First, you must anesthetize the surgeon. Not the patient.... you. Brace yourself. Take a long, deep breath. Take a moment to contemplate what you are about to do. Take a swig of Granny's rheumatism medicine if necessary. Close your eyes and say to yourself, "Yes, this IS simple, and I CAN do it!" With the surgeon now (reasonably) calm let's cut open the patient. This is done by removing the 4 small screws that hold the mounting flange to the TC. Take care in doing this, and do not apply too much torque without enough pressure on the screwdriver that you cam out the head of the screw and strip it. If you cannot get all four screws loosened, it's best not to try to force them and stop now. 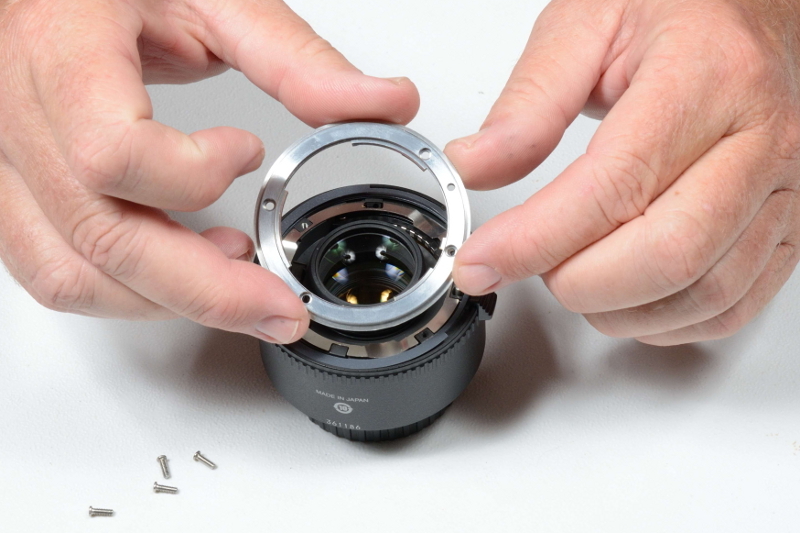 Once you have the screws removed, it's time to pull off the lens flange. This is the most delicate part of the operation. As the flange is lifted, there's a couple of parts that may want to come along for the ride. One is the spring-actuated lens catch pin that stops the lens when it's mounted, and must be pushed back in order to remove the lens. There's also a thin metal 'shim' that goes all the way around the TC. 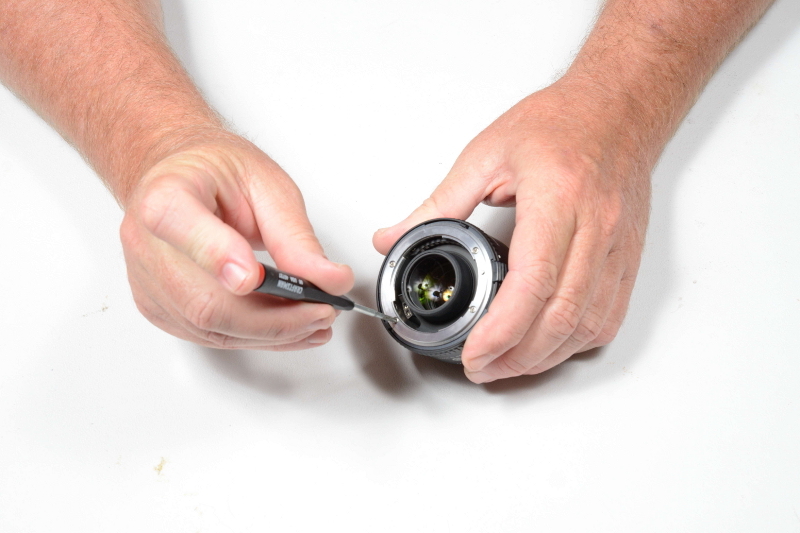 Just slowly remove the lens flange and push the catch pin and shim back down if they start to come up with the flange. Once the shim and pin mechanism have been settled back into their normal positions, the lens flange is now free from the TC. Now, take a BIG sigh of relief as the hardest part is over. You now realize there's no other spring-loaded parts that will go "BOING!" and toss tiny, irreplaceable parts all over the floor. 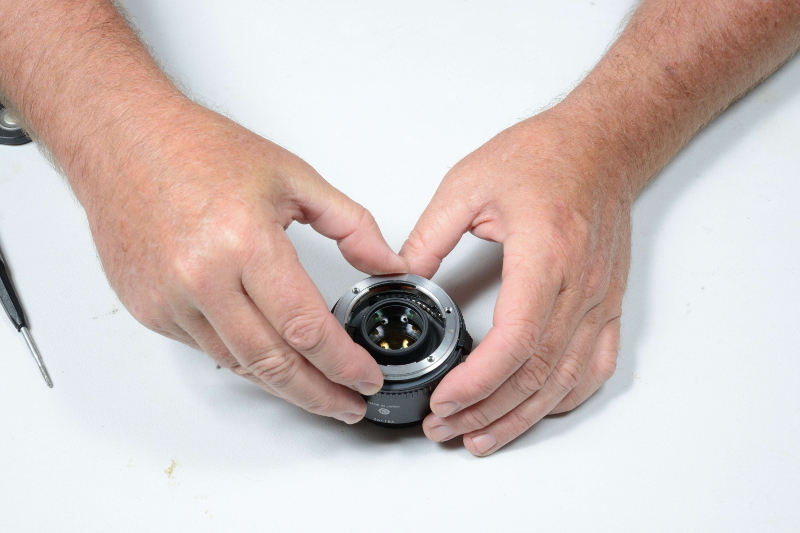 The lens flange is now 'in hand', as it were. 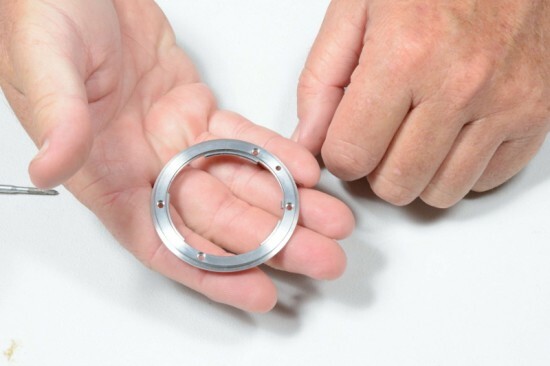 With the flange separated from the TC, place the TC and the 4 screws in a place where they won't be disturbed and away from where you are going to be performing the next step. ... or, like most do, a hobby drill. I'll be honest here. I didn't do the grinding inside. I took the flange and the tool outside and did the grinding on the deck. This is to keep the small filings from getting into the living room carpet. With the attachment shown in this image, it only took me about a minute to grind off the tab. And that's with the hobby drill at it's slowest setting, and using a VERY light touch. Little pressure is needed.... you're not putting an edge on your lawn mower blade here. Slow and steady wins the race. With the tab now in minute pieces in the back yard, it's time to reassemble our precious TC. 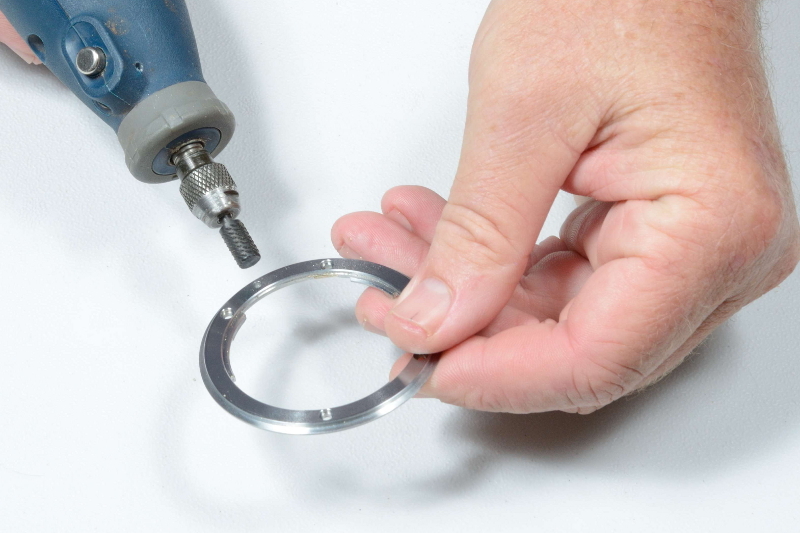 Start by lining up the pin mechanism to the appropriate hole in the flange. 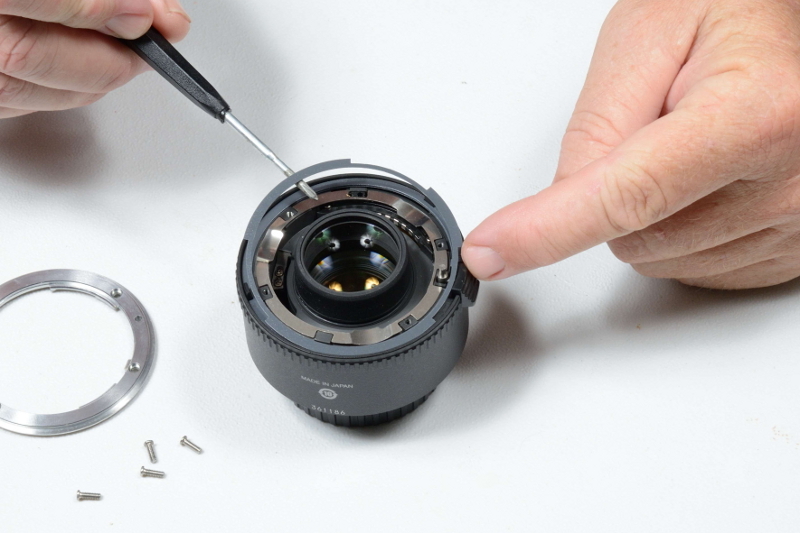 Replace the four screws, using a slight pressure on the flange to line everything up. I would recommend you 'start' all four screws first, and make sure they're all lined up properly and not going to strip out or cross-thread on you. Once all four are 'started', tighten them all up. And with that, surgery is complete. One shaved Nikkor TC. The surgeon may then retire to the recovery room, have a snort and take a nap. Or better yet, put the TC on a lens or two that previously could not be used on it, go out, and take some photos! 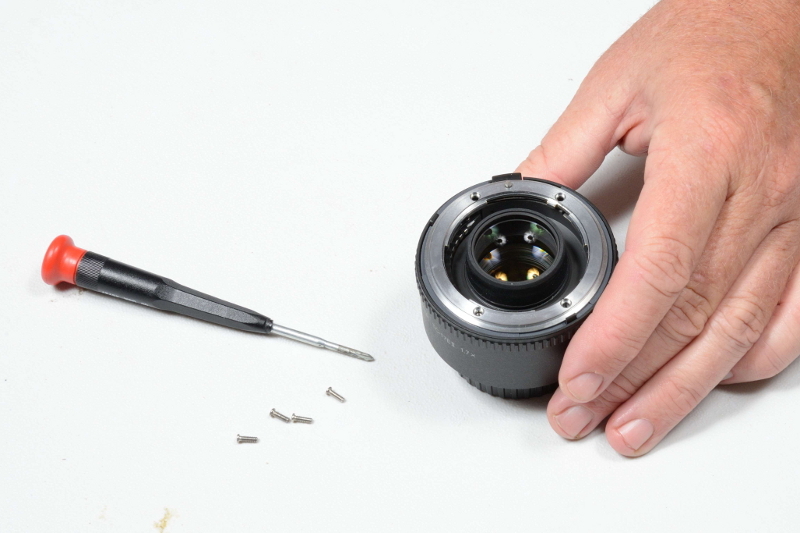 This post on how to "shave" a Nikon teleconverter is written by Ken DePue and was initially published at thephotoforum.com. 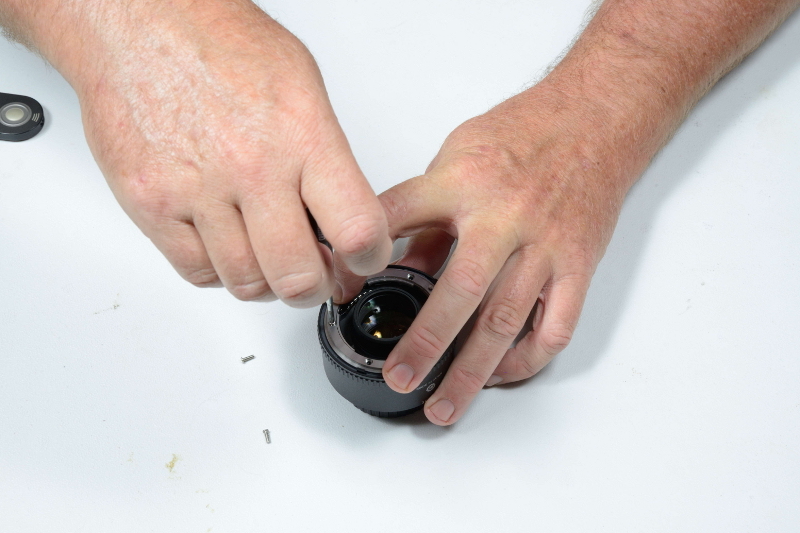 This entry was posted in Nikon Lenses and tagged DIY, [NR] Guest Posts. Bookmark the permalink. Trackbacks are closed, but you can post a comment.